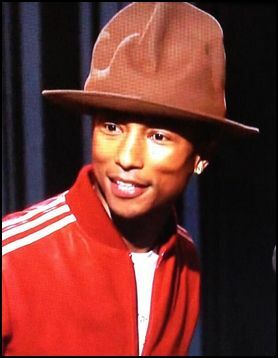 As far we we’re concerned, Pharrell Williams can wear all of the hats. The man, easy on the eyes, also made “Happy,” “Get Lucky,” and “Blurred Lines.” And that was just last year. But Pharrell is also well known for his fashion sense. Very cool, a little quirky, the hat he wore to the Grammys generated as much talk as anything else on the awards show, sparking comparisons to one that Canadian mounties wear, Smokey the Bear, and even getting it’s own Twitter feed. 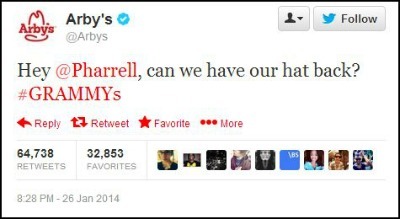 But some clever someone also noticed a resemblance between Pharrell’s hat and the Arby’s logo. Not wasting any time, Arby’s shot out the tweet above. It was just one of many brands that are mostly unrelated to the music industry that tried to capitalize on the Grammys Twitter action. 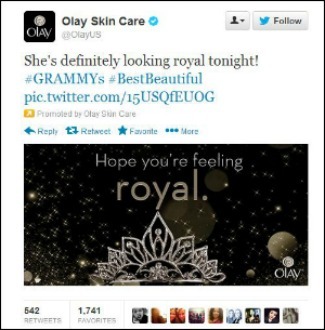 Olay congratulated Lorde on her win. 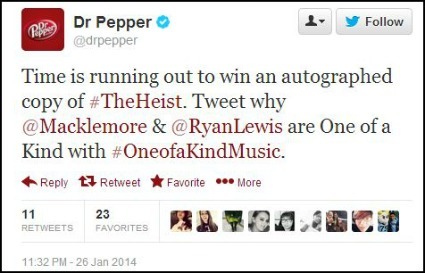 Dr Pepper plugged a Macklemore & Ryan contest. After Oreo won Twitter with its off-the-cuff tweet during the Super Bowl black out last year, brands have been trying to strike gold with their own clever posts during big events. Arby’s did a pretty good job, but otherwise, we can’t think of a Grammy tweet that matched Oreo. If you can, let us know in the comments.